Classic looking long-lasting sturdy plastic planter. Ideal for larger single specimens like palms, or for bright and bold bedding plants. UV and weather resistant - reusable season after season. Finished with a lovely metallic-gold paint. Add a touch of class to your patio with this stylish planter. 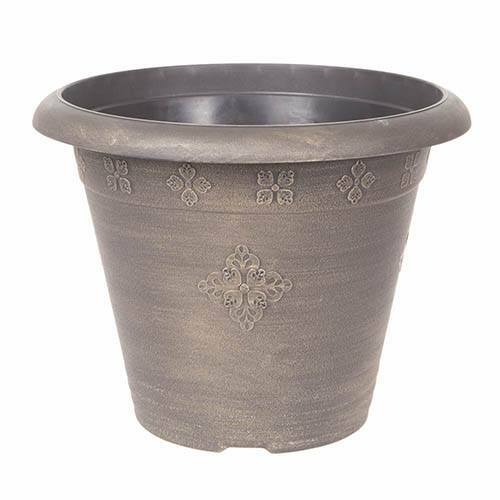 The 'Medley' bronze effect planter is ideal for finishing off displays, from colourful summer bedding and patio plants, to bulbs and even house plants. A fabulous and classic looking, long lasting, sturdy plastic pot, its also perfect for larger single specimens like palms. A far cheaper alternative to expensive ceramic or metal pots, it's lightweight and easy to transport around the garden while still providing a tough and durable support for plants. Supplied as 1 x 37cm Plastic Planter with a bronze finish (hand-washed gold over black). Made from a durable UV stable plastic, and hand painted with a bronze metallic finish.